DC Fit Week, a free week of fitness activities in the DC metro area, kicked off this past Monday. I found out about it through Twitter; some of my friends are on the DC Fit Week team and actually organized it all. The week focuses on physical, financial and mental fitness and provides a variety of events from free classes to happy hours and more. Tonight was the fitness expo benefiting WGirlsDC, complete with a fashion show, auction and expert panel. 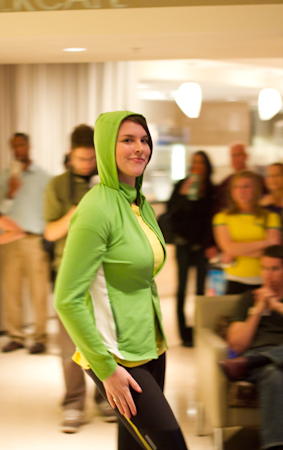 Below are some pictures from the fashion show featuring clothing from Pacers Running Stores and Lime Activewear.